Robert the Doll currently "resides" in the East Martello Tower and is rightfully regarded as one of Key West's most sinister figures. So menacing is this "toy", that it was the inspiration behind the movie Chucky, and if an "inanimate" object could be evil, it would certainly be this one. The word "inanimate" is used loosely, because this doll was reportedly seen moving on many occasions, from window to window in the art studio turret, glaring at those passing by. "Inanimate" because the family who purchased the house after Robert "Gene" Otto died, found the doll in different rooms of the house. "Inanimate" because the last time they saw the toy, was before they immediately fled the house. The reason - it was standing at the foot of their bed, viciously clutching a knife, and evilly staring at them. 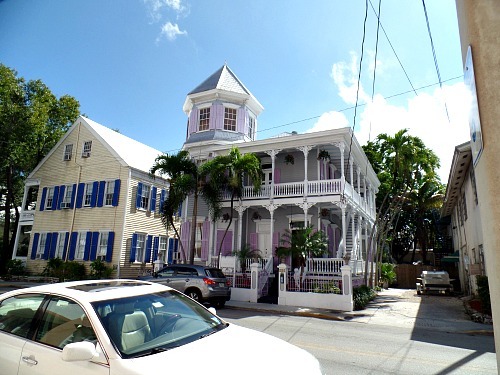 The horror story all begins when the Thomas Otto family lived in what's now the Artist House Bed and Breakfast, located at 534 Eaton Street, Key West Florida. The family was wealthy, and between work and travel they were unable to spend quality time with Robert, their young son. To help care for their child, they enlisted the services of a young woman who developed a strong bond with the son they'd nicknamed Gene. When the caregiver and the mother had a falling out, the woman was fired. Before leaving she gave her young charge a final present. It was a life-sized doll she'd crudely fashioned in the young boy's image. It was believed that Gene's caregiver was someone who practiced voodoo. Whether she worked her black magic on the doll, no one knows for sure. However, over the years until his death, Gene blamed all the unusual and often violent circumstances that ensued in his life on his toy. As a child, Gene was always heard carrying on conversations with the toy, and the servants routinely reported hearing another voice in the room. Often the toy was seen scowling at Gene, and many destructive acts occurred when the boy and doll were in the vicinity. Each time the boy was blamed, and each time he loudly declared, "Robert did it!" Finally the possibility was presented to the parents that the doll may be evil. Unconvinced, but willing to try anything to curb the bad behavior, they confined the toy to the attic. The end result was that their son was unable to endure the separation, and the parents finally succumbed and returned the doll to Gene. The bond that had been forged between Gene and his toy continued throughout his life. As a married man, his wife Anne detested the "toy" and her husband's peculiar relationship with it. Plus the strange and scary incidents continued on a regular basis. With so many unusual and frightening occurrences happening, Anne found it increasingly difficult to keep her staff. In a bid to gain control over the situation, she confined the sinister object to the attic. Her determined effort however was short-lived. Her husband angrily claimed that his doll was unhappy locked up in the attic. He promptly moved him down to the turret room where his art studio was located. It's from this room that neighbors and children reported seeing it move from window to window, watching and glaring as they passed by. Eventually Gene grew old and when he passed away, he was found in the turret room, lying next to his toy. Even though Robert the man was gone, Robert the doll carried on. The new owners of the home relocated him back to the attic, but after doing so, disturbing sounds and evil laughter emanated from various parts of the house. The toy was also routinely found in different locations, but the final act that forced them to permanently leave, was the most ghostly of all. There, at the foot of their bed, they saw this supposedly innocent toy menacingly clutching a knife in it's hand. After the family left, the toy was once again confined to the attic. Even though Robert the Doll and everyone else associated with it have long left the Artist House Key West, a presence still is here. Guests staying at this luxurious bed and breakfast have reported seeing a woman, perhaps Anne, dressed in a wedding gown gliding down the staircase. There is so much controversy about this doll, and it's apparent 'evil' that numerous books, even movies have devoted themselves to the subject. Is This Sinister Toy Changing? For years the toy stayed locked in the attic until it was finally relocated to it's new residence in the East Martello Tower. This link will also take you to a particularly good video on this subject, the Tower, and it's ghosts. Today, visitors to the East Martello Tower are able to view the toy in a large enclosed case. It is said that before taking his picture, permission must be asked. Those who don't, experience unfortunate incidents. The least serious issue, and the most common problem, is that all the pictures taken turn out except the photos of Robert the Doll. Reports also abound about his physical appearance. His eyebrows will change position, his eyes will take on a menacing look, even the small lion he clutches has been held differently. Reports now indicate that his hair is getting white and falling out, and it's suggested this means that Robert the Doll is aging, perhaps even dying. This short video is a good example of the different changes in his appearances. There are a few misspellings on the video, which we're all guilty of, but nonetheless, it's interesting to view. 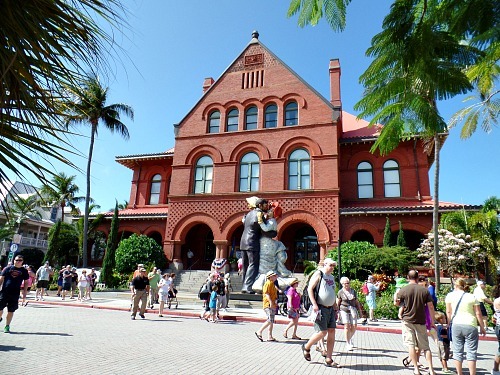 Every October, Robert the Doll makes his annual pilgrimage to Key West's Old Customs House where he sits on display. He never seems able to stay the full month however. It seems that the ghosts of Key West who inhabit the East Martello Tower miss him. Eventually the staff of the East Martello Tower have to request that Robert the Doll be returned early, to keep their ghostly residents happy.